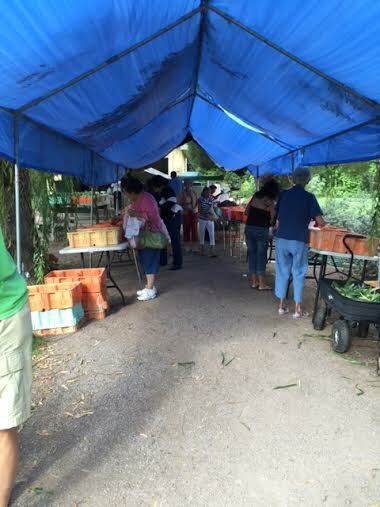 Eating fruits and vegetables in season is good: Getting them right from your neighbor's farm stand is even better. This summer, we are eating fresh, and we're eating just about as local as we can get. 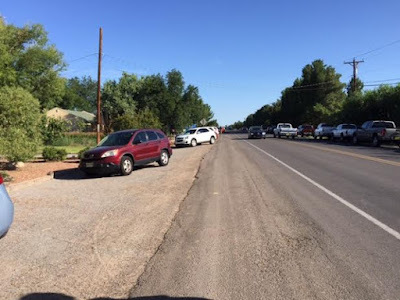 Every Wednesday and Saturday morning during the summer, we experience what might be considered a little traffic jam just down the road and around the corner. The cars and trucks line the sides of the road, waiting for 8AM when the family owned and operated Hale Farm's stand opens up. 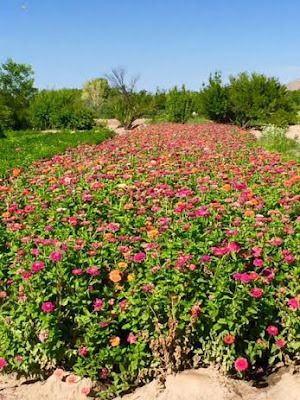 While we wait, we admire the rows of vegetables and flowers and the view of Picacho Peak in the distance. At opening time, folks grab a little red wagon and fill it with green chiles just brought in from the field, watermelon, garlic, onions, okra, cucumbers, black-eyed peas, tomatoes, cabbage, new potatoes. 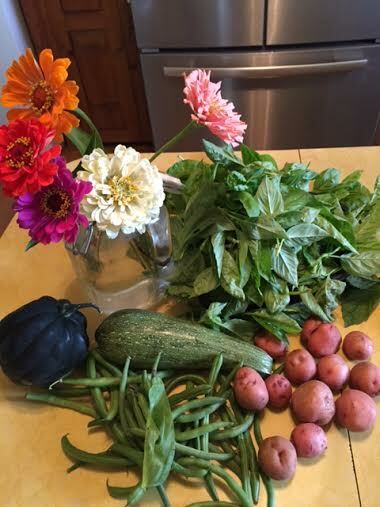 eggplants, squash of all kinds, green beans, fragrant basil, honey from the hives out back, and cut flowers. Oh, and the best sweet corn on the cob that I've eaten in years--Bill grills it in the husk. Those are just some of the items I've seen so far, and we're still at the beginning of the season. The line at the cash registers stretches out to the road, while the neighbors chat and kid each other good-naturedly. The lady at the register says "There's got to be a place where no one's in a rush, and this is it!" We all agree, while reaching over for a few more fresh green beans. This is part of our haul from this past Wednesday. Tonight we're having grilled corn on the cob and a salad made of those red new potatoes, green beans, and pesto made from that good-smelling basil. So healthy, and so delicious! 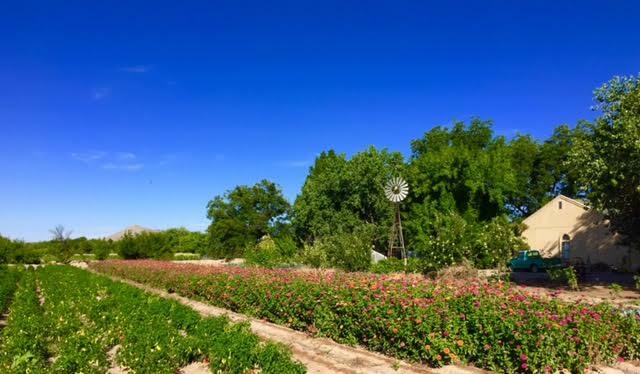 If you want to see what's going on at the farm, you can like them on Facebook at Hale Farm (Las Cruces). July is our time for big storms. In fact, the storm that took down one of our big Chinese elm trees and knocked the top off the gas meter happened in July 2010. You can read Librarian Needs Spelling Lessons and the following posts for that frightening adventure. This year was no different; the wild storm of July 10 brought down half of another Chinese elm and its branch full of bees. 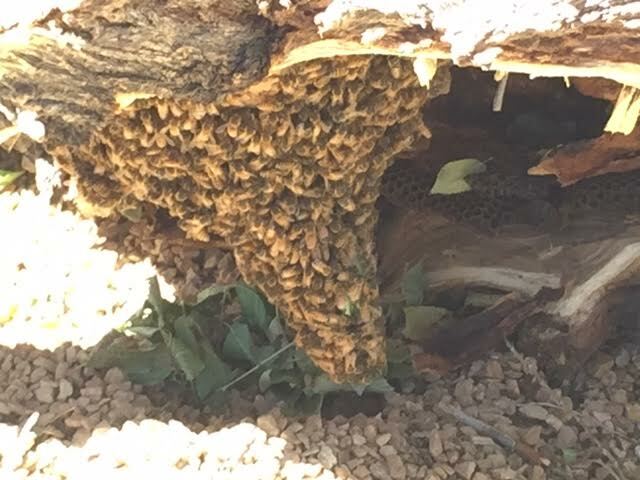 Here is an explanation of why bees swarm. Ours were honeybees and very calm and focused on their job of protecting the queen and waiting for the scout bees to find them a new home. 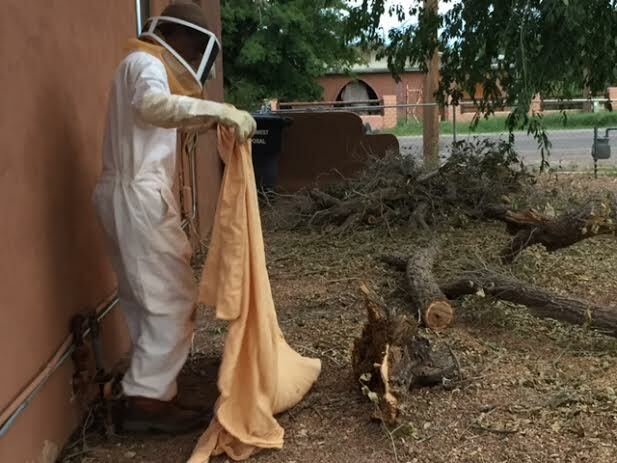 They were not "killer" or Africanized bees, which will attack in great numbers at the least little disturbance. Normally, we would let nature take its course and just wait for the swarm to relocate. 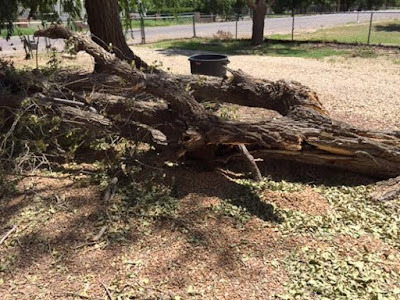 However, the rest of our trees are going to be removed, and we are surrounded by pecan orchards that are regularly sprayed. 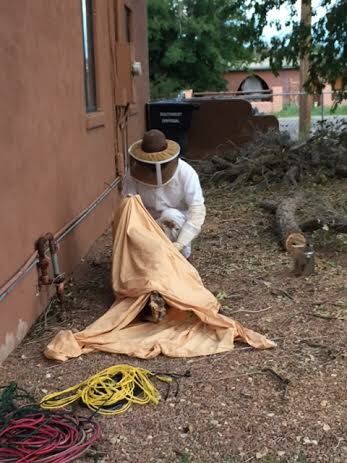 Out of concern for the welfare of the bees, we decided to find someone to relocate them. It took a lot of asking around until we spoke with some honey producers at the local Farmers Market. 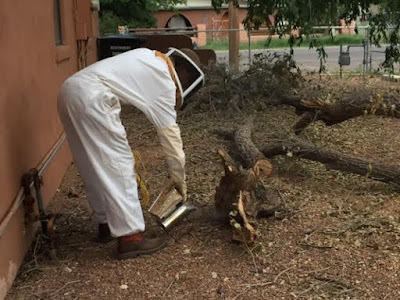 They directed us to Anthony, who is starting up some hives. 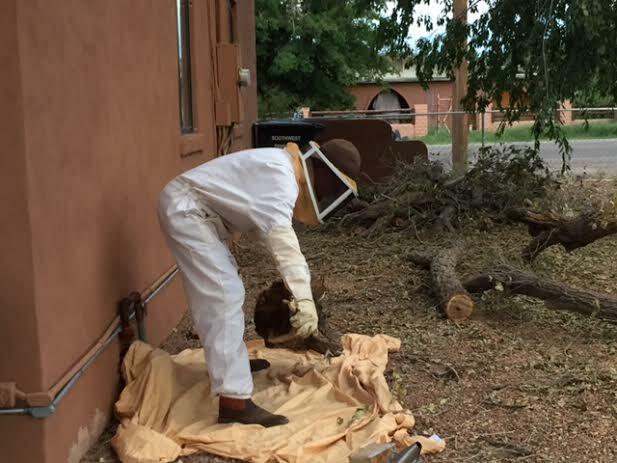 This was only his second time gathering up a swarm and he did a wonderful job, with his calm demeanor and gentle movements. 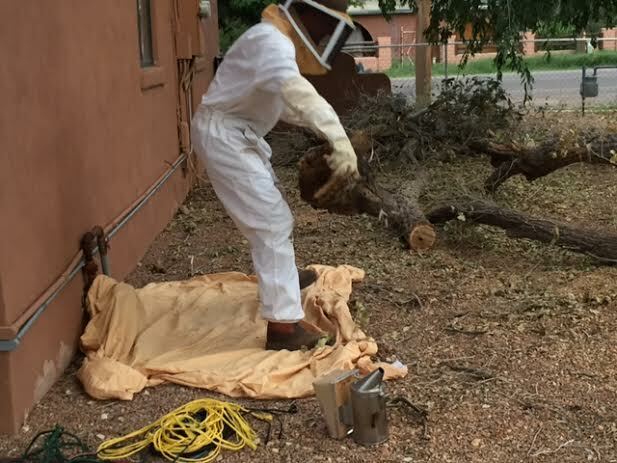 Not all bee swarm captures are so calm and successful; to see some really awful ones just go to YouTube and search "bees swarms gone bad." I couldn't watch any of the videos to the end! 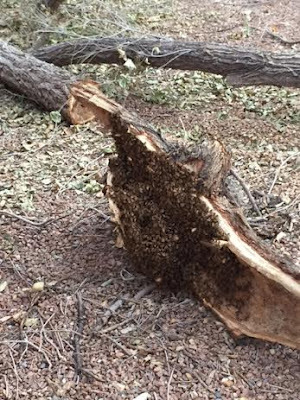 When the swarm and the branch were all wrapped up, they were placed in the bed of Anthony's truck and off they went to their new home up in the Organ Mountains. Once the bees are settled in their branch on the ground at Anthony's place, he plans to "build around them," using the top-bar method. We had a delightful time talking bees, sharing the capture experience, and taking pictures along with Anthony, his wife Lydia, and their sweet pup Lennie. 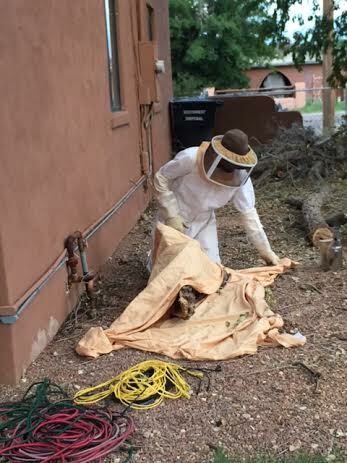 If you need a good bee whisperer in the Las Cruces area, let me know in the comments. "The telling of the bees is a traditional English custom, in which bees would be told of important events in their keeper's lives, such as births, marriages, or departures and returns in the household. The bees were most commonly told of deaths in their master's family. The custom was prevalent all over England, as well as in a few places in Ireland and Wales..." -- From Wikipedia, Telling the Bees. 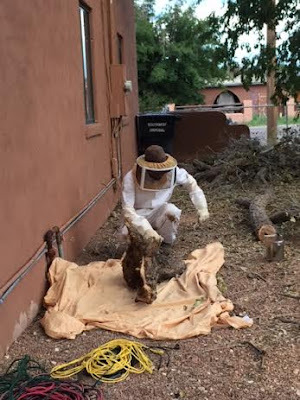 You'll want to see this video of a four-year-old handling bees. P, I'm so sorry to hear about your fall. Were you alone when it happened? How did you get help? They always joke about aging not being for sissies but boy are they ever right. Today I was thinking that I should look around the internet because surely someone has written a funny song about all the thrills (and spills) of getting old. There would have to be a stanza about what happens when you laugh too hard (cross those legs, ladies, it's leaky time! 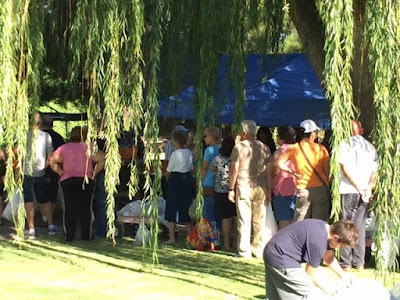 ), and one about the joys of a high fiber diet (eat fiber because the colonoscopy doctor told you to do it, add up the insufficient fiber grams, sigh and eat more fiber, sit around feeling bloated while processing the fiber, run to the bathroom, quick! quick! quick! before it's too late, then repeat the whole cycle). Today I am sporting several bandages, having been half nibbled to death by the dermatologist. Oh, good, just another ten days in hot weather when I can't get those bandages wet while I wait to hear if I have some terrible skin disease, tra-la! C, I never get into the shower without thinking about your terrible shower fall. I will be thinking about you again in ten days, when I'm finally allowed to shower again. Guess what? 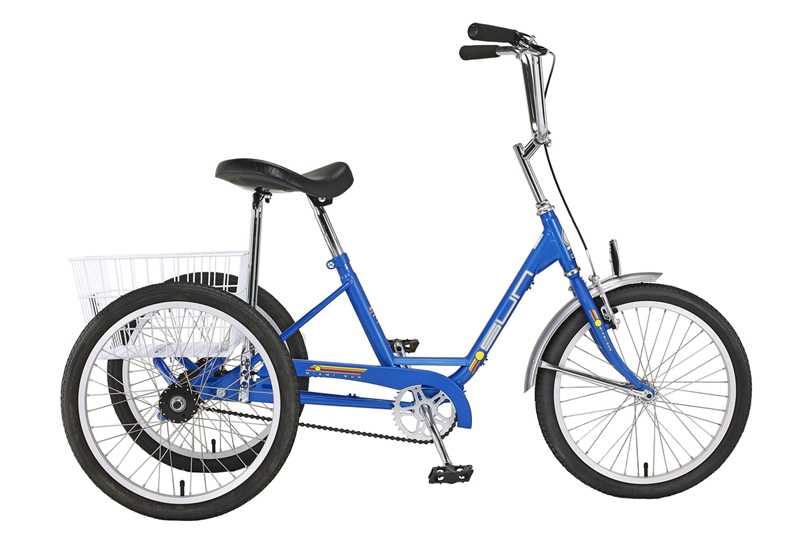 I just got a tricycle! There really is some message about the circle of life there. A couple of years ago Bill bought me a very pretty two-wheeled cruiser bike for Christmas, but I fall off of it. The last time it threw me, I was just standing still while holding it and chatting with a neighbor. It flung me right into the roadside gravel. Getting up is no picnic, as you may or may not know, and I didn't even have to do the usual quick look around to see if anyone noticed my embarrassing fall. 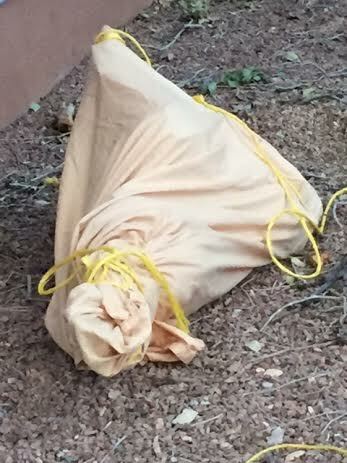 Nope, the neighbor was still right there, looking appalled and probably wondering, how on earth did she do that? So now I have a nice stable tricycle. Bit of a wide load (ha ha) with those two back wheels, and the seat is built just like one on a tractor. Nice, fat, broad, comfy seat. I was interested to find that it just exactly fit me! It's not easy to steer a trike, I've found, so although I don't have to worry about falling over I still have a way to go before I can steer a steady course. But how nice to be able to get out and get some exercise without damaging myself too severely. Which makes me think of my adventures at the gym. Last time there I was diligently wiping down the control panel of the treadmill I'd just used. Unfortunately I also wiped the "on" button, so as I turned to step off I got a little power boost, sending me off the back end a little faster than I usually move. Lucky for me, my fellow jocks were busy huffing and puffing so they didn't notice my unintended burst of speed. So, have I covered our aging issues? Diet, exercise, medical tests, doctor's orders... Wait, there's one more. Today I picked up a prescription written for me by that nibbling skin doctor. After reading the possible side effects, I see that I'm apparently looking at symptoms that may or may not include more bloating, gas, and nausea (just like the special effects of the high fiber diet), possible loss of sense of smell and taste (lasting for up to a year), and accidental weight loss (can't wait for that one). On the other hand, if I decide to forgo the medication because of the dire warnings about potential liver damage, I face a future in which whatever is going on with my toenail (sorry I didn't attach a photo, lol) will spread to my artificial knees and will actually implode me, saving my family all the trouble of spreading my [future] ashes. I send you both much love; that's another good thing about being older--you just go ahead and tell people that you love them.